As mentioned in Part I, Diablo III will be adding in a few new classes and one of the most interesting classes added to the third addition to this classic dungeon crawler is the Witch Doctor. For those not yet included in the closed beta testing of Diablo III, the easiest way to describe the Witch Doctor would be to say that its the equivalent of an Affliction Warlock combined with a Frost Mage. 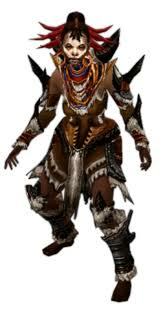 With abilities like Grasp of the Dead, which slows groups of enemies by a considerable amount in an eight yard area, coupled with things like Haunt, which is a devestating Damage Over Time spell that transfers between enemies in groups for a period of time, the Witch Doctor is virtually unstoppable. If controlling haunting spirits to do your bidding isn’t quite your thing, you always have the option to summon a small pack of Zombie Dogs ( who doesn’t want a pet Zombie?) and destroy your enemies with other spells such as the Skull of Flame, which is exactly what it sounds like with a little explosive kick for flare. Finally, if this is not enough to fill your Witch Doctor needs, send your enemies back the the flaming depths of Hell in true Biblical style as you create Plagues of Toads and Locust Swarms. ← Are Arcades Making A Comeback?